Over the bank holiday I went in search of some new birds but found myself getting close to a different sort of winged creature. I headed for the Newport Wetland Reserve run by the RSPB in the hope of spotting some waders. The reserve is located on the south Wales coast near the estuary of the river Usk. The main habitats are reedbeds, mud flats and salt marshes. Waders are a large group of birds that typically have long legs, long necks and long beaks and feed by wading through mud. After attempting to spot some waders feeding on the retreating tides (I got the times all wrong) I happened across some colourful insects among the reedbeds. As always, nature caught my attention and the plan went out the window! It took some time and a lot of patience but I managed to get close and get some photos of the colourful insects. Armed with this I attempted to figure out what they were later on in front of the computer. At this point I must state that I don’t have a zoom or macro lens on my camera, but I have moved to using my SLR as the smaller point and shoot has taken a leave of absence – good-bye Mr. Flicker! Later on I luckily bumped into Bill Jones – who is the man to ask about dragonflies. He runs a website which provides extensive information on dragon flies in south Wales, where to find them, how to identify them and even gives tips on how to take photographs (I need to read these again!). 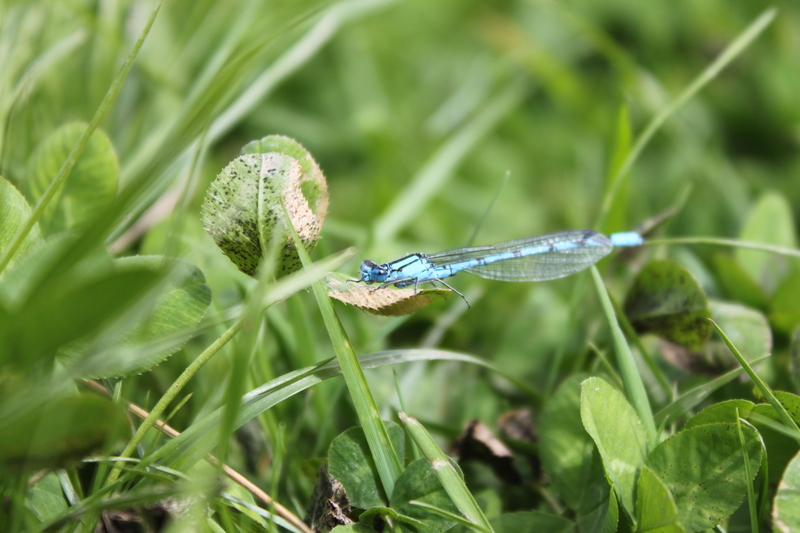 In terms of ID – I started by trying to figure out the main differences between damselflies and dragonflies. The most obvious difference seems to be size with dragonflies being larger and sturdier than the smaller and daintier damselfly. Secondly dragonflies have larger and thicker abdomens. Another key ID factor is the position of the wings when the insect perches/lands. The dragonfly will hold it’s wings in an open crucifix position while the damselfly holds them closed parallel to the abdomen. The first insect I photographed I’m confident in saying was a damsel fly. It’s wings were folded close to its abdomen and it was small. There are a few very similar blue damsel flies, and I’ve found out it’s important to look closely at the markings on the abdomen to identify the species. I started looking though the blues and ruled out a few (scarce blue tailed and blue tailed) but that still left 2 which were very similar. It soon appeared to be the key was having good clear detailed photos – I was worried I didn’t have the right shots – as I wasn’t sure what I was taking photos of on the day! I examined the photos I had in detail, focusing specifically on the last few segments of the abdomen, this was the key – I think! I decided on the common blue damsel fly as it has all blue upper surface of segments 8 and 9. The second insect I pictured I would happily say was a dragonfly. It sat with his wings open in this crucifix position and was larger. It was challenging to get close to, but thankfully seemed to enjoy the heat radiating from the concrete slab next to the reedbed, so I could position myself and wait! According to Bills website, this particular dragonfly is a good species to practice your photography skills on! It has a brown head and a red banded abdomen. After examining some photographs and following some ID keys I narrowed my species search down to two dragonflies. The common darter and the ruddy darter. Again my focus was brough back to the abdomen, with the ruddy darter having a club-shaped abdomen, which the common darter being narrow and straight. 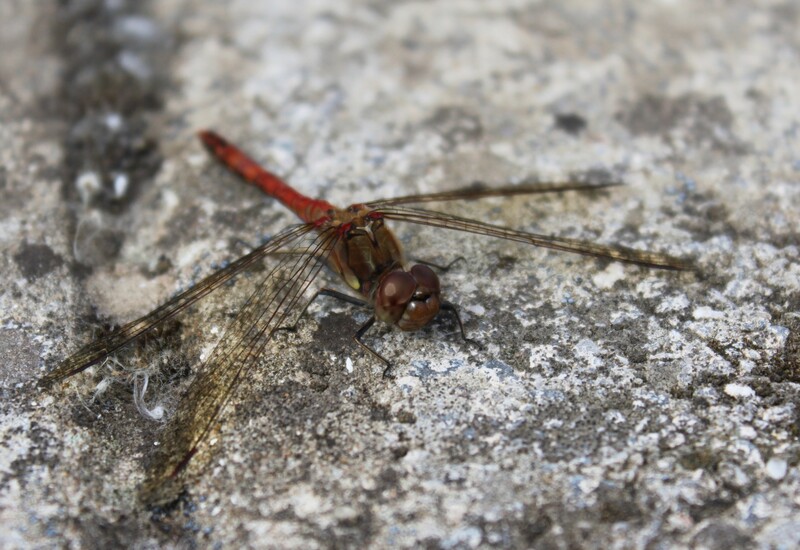 I decided it was a common darter. While walking with Bill we did encounter a very large and curious green dragonfly. The female southern hawker (thanks Bill) landed on a bramble bush near bye to eat her lunch, which seemed to be a fly. A wonderful treat, but I wasn’t quick enough to get a photo, maybe next time! Check out Bills website for some wonderful shots!